I do a lot of restaurant and recipe reviews but it's not very often I do a product review. No one asked me to do one and I didn't get any freebies either. I've been thinking about getting some new containers for my spices for a while now but have been pushing it off. A couple of people mentioned the SpiceCare system via Facebook comments to a post I made many months ago and I have kept those in mind since then. What finally pushed me to get these is my switch to all organic spices. I bought them in bulk from Mountain Rose Herbs. I don't know why I didn't do this before. The prices for spices at Mountain Rose can't be beat. 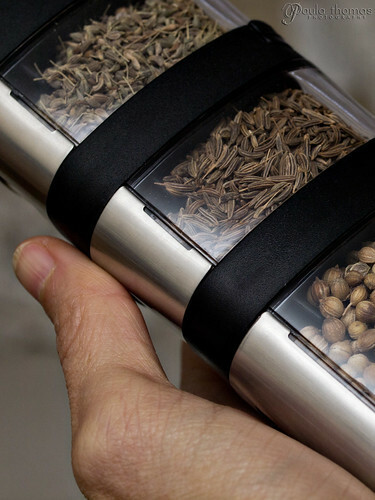 Gone are the days of spending $5 for a little bottle of spices. You can get 4 oz packages of just about any organic spice you can imagine and most of them are between $2 and $4 a bag. One of these bags would probably fill up a grocery sized jar at least 4 times. They also carry teas, oils and other goodies. I bought a couple of 6 container SpiceCare starter kits and some singles. I've managed to fill them all up with spices and could use a few more. I also bought the label pack which has pre-printed spice labels. There's only one spice I wasn't able to find a pre-printed label for and that is for the curry leaves. 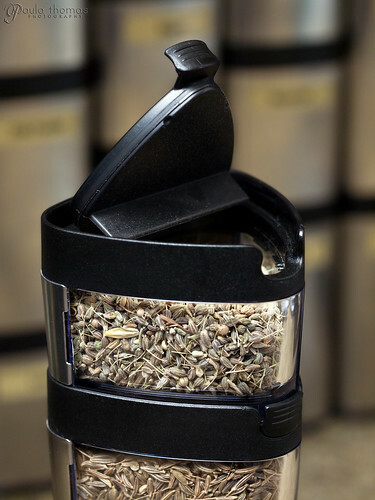 The label fits behind a metal plate that slides over the front of the spice container. The smallest sized ones are more difficult to slide on and off. It's also hard to figure out which is the top and which is the bottom of the metal plate on the small ones. The containers are three-sided and made of a hard plastic. Two of the sides are clear so you can see the contents and one side has the metal plate with label on it. All the containers can stack on top of each other and come with flip top lids. One of the things I like most about these contains is the lid which has a leveler built into it so you can use it to level off your measuring spoon. You can also buy the optional shaker screens, which come in three different sizes, but I chose not to. I prefer to be able to stick my measuring spoon in the container without having to fuss with removing the screen. These containers are a real space saver. My old spices were organized alphabetically in store bought glass containers of all different shapes and sizes in my cupboard. Now I have them organized more conveniently by types of spices in the SpiceCare containers. I have all my whole seed type spices in one column, two columns of powdered spices, two columns of leaf spices and I have one column with what I would categorize as pumpkin spices (allspice, cinnamon, cloves and nutmeg). 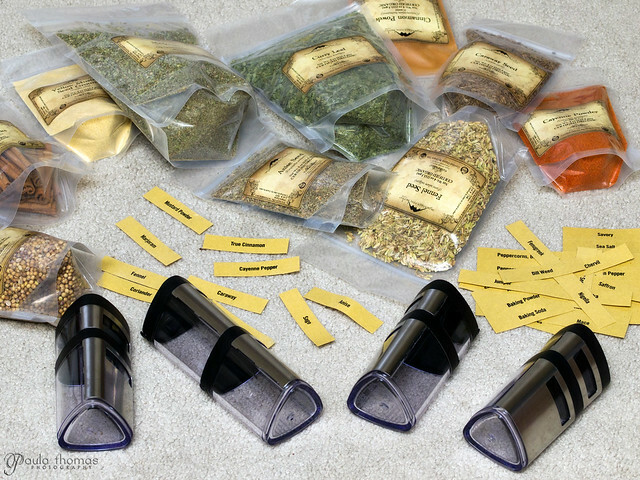 If you're looking for a new way to organize your spices I would highly recommend these SpiceCare containers by Table Fare. They save space, look great and are convenient and easy to use. I'm so glad you love your SpiceCare! Your photos look fantastic. I love seeing how people group their spices. Your "pumpkin spices" are very similar to my stack of baking spices. Hey, did you know there's a print-your-own label feature on their website? It's great! Yeah, I did see something about a template for making your own labels. I need to get a few more containers. I'll try making a label for my curry leaves. I have some lavender buds too that I might get a container for too. 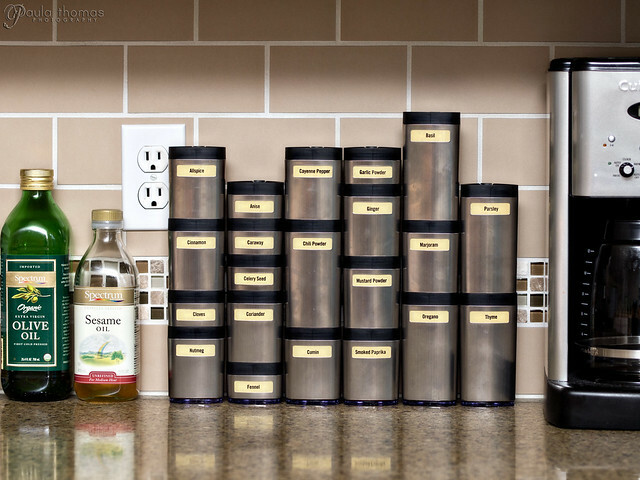 SpiceCare containers are helpful at cutting clutter and saving space. Glad they've found a home in your kitchen, too! Yup, I'm still pretty happy with it. I think I ended up buying one of the large sets and then a bunch of individual containers. Thanks! It would be a big initial investment, but it seems like it would be worth it. The differing sizes just seem so much more functional than anything else I've ever seen.